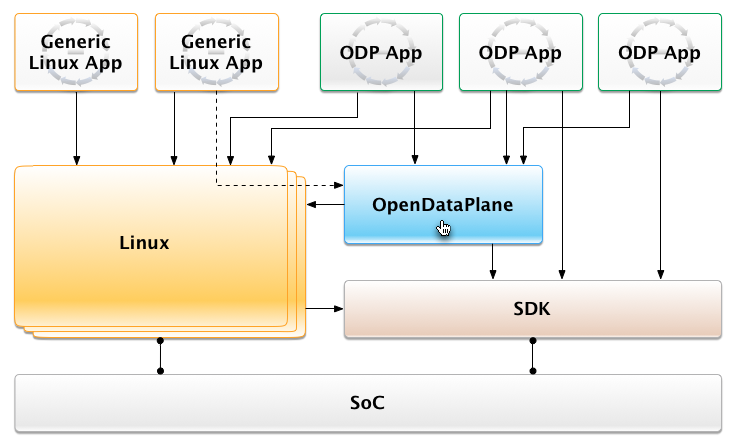 OpenDataPlane (ODP) is an open source API defined for networking data plane applications programming. 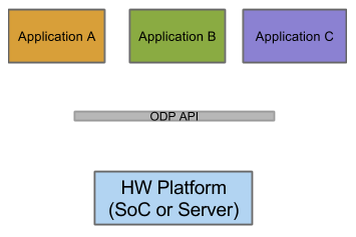 The primary goal of ODP is to provide a common set of APIs for application portability across a diverse range of networking platforms (SoCs and servers) that offer various types of hardware acceleration. As an abstract API specification, ODP permits applications to run on and exploit the hardware offload capabilities of various platforms without requiring expertise in the nuances of any target platform. 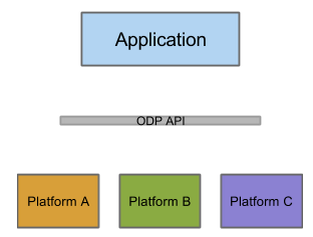 At the same time, ODP is also a set of implementations of these APIs that are optimized for each platform that supports ODP. Implementations of ODP currently exist for a wide range of platforms spanning diverse instruction set architectures including ARM, MIPS, Power, x86, as well as proprietary SoC architectures, and include both general-purpose servers as well as specialized networking SoCs. This freedom is further enhanced by ODP’s use of 3-clause BSD licensing. ODP APIs are fully open source and open contribution, however individual implementors of these APIs may choose to make their code open or closed source as business needs determine. As part of the main ODP distribution, several reference implementations of the ODP APIs are made available and these implementations are themselves open source and open contribution. These reference implementations are designed to offer a good starting point for those wishing to develop their own implementations of ODP tailored to their platform, or to gain experiencing developing ODP applications without needing anything other than a standard Linux platform. Also included as part of ODP is a validation test suite that permits applications and vendors to confirm that a given ODP implementation conforms to the ODP API specification, thus ensuring consistency and portability across various implementations of ODP. The data plane is the part of a network that carries user traffic. The data plane, the control plane and the management plane are the three basic components of a telecommunications architecture. The control plane and management plane serve the data plane, which bears the traffic that the network exists to carry. ODP is only concerned with the data plane. ODP is a member of the OpenFastPath (OFP) Foundation and its member companies. These companies include network system vendors, silicon vendors, and software solution providers who are working to promote a truly cross platform solution for data plane applications that is portable across a wide range of network silicon yet can take full advantage of hardware acceleration and offload capabilities offered by these platforms. To support Software-defined networking (SDN) in which control is decoupled from the physical infrastructure, allowing network administrators to support a network fabric across multi-vendor equipment. To support Network function virtualization (NFV) which is an initiative to visualize the network services that are now being carried out by proprietary hardware. To enable a platform agnostic open source community to develop hardware accelerated software that is very portable. What is the ODP project history and status? The ODP project was launched in 2013. The first full-feature release of ODP occurred in March of 2015 and a production-ready release called Monarch was released in 2016. Where does ODP fit in the solution space? Although ODP applications are independent of available network speeds, at present the benefits of ODP are best seen on networks operating at 10Gb/s and above. This allows ODP applications to transition seamlessly from software-based acceleration found on general purpose servers to hardware acceleration found on specialized networking SoCs. At present this spans the “sweet spot” of speeds from 10Gb/s to 100Gb/s. Beyond 100Gb/s ODP abstractions have not matured enough to completely describe full offload processing, although this is a long term goal. What does a typical application packet flow look like? Using the scheduler and an event driven model, packets are distributed to available workers maximizing the capacity of the cores. Where possible, the function will be performed in hardware (red). Migrating to a device where more of the functionality is in hardware will result in greater throughput without rewriting the application. In addition, migration to a device with more cores will automatically spread the load achieving greater throughput. What does the ODP software stack look like? An application written to the ODP API will be linked to the ODP implementation for the platform on which it is executing. This implementation will have been optimized for that specific hardware; it will often call the native SDK via an inline call, which also allows the application to simultaneously take advantage of vendor extensions that have not yet been standardized. What platforms does ODP support? To date, ODP is running on seven different network platforms that span five different processing architectures (ARMv7, ARMv8, MIPS64, Power, and x86), offering both application portability and accelerated performance tailored to each platform. Other implementations are under development by both LNG member companies and other companies participating in the project. What OS is typically used with ODP? ODP applications usually run as Linux user space applications, but there are also a number of “bare metal” environments in use. A typical deployment will be using Linux as the control node on at least one CPU and then using the NO_HZ and isolation features of Linux to essentially run the application fast-path packet processing code as if it were using “bare metal” on the remaining cores. ODP is a true open source, open contribution project that is distributed under a 3-clause BSD license, meaning that anyone is free to use, modify and distribute it for commercial or other purposes without restriction. ODP has a public mailing list (odp@lists.opendataplane.org), and discussion on this list shows the wide base of participation in the ODP project. There are also a number of independent externally hosted ODP implementations. The ODP linux-generic implementation is a functional reference targeting simplicity over performance if there is marked difference. The higher-performance implementations of ODP come directly from the vendors. Does ODP really help portability? Yes. ODP abstracts hardware capabilities for data-plane processing so that applications may be written more portably Application developers may make use of important hardware capabilities such as crypto hardware acceleration without needing deep knowledge of the hardware or the vendor-specific SDK associated with it. This will make it much easier for them to write portable applications that work well across multiple hardware implementations. 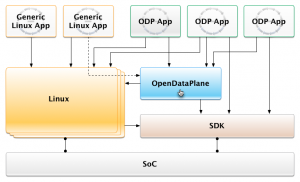 Can ODP inter-operate with a native SDK? Does ODP allow software extensions? No. the ODP API does not allow for software extensions. However, ODP does not preclude calling a vendor’s SDK in parallel with ODP but the expectation is that over time any features that become common to multiple platforms will be supported in future versions of the portable ODP APIs. Does ODP work with FPGAs? There is no explicit initialization support for altering the image in an FPGA at boot time, but several major players have looked at ODP and we hope they will help define the support they require. Does ODP work with NICs? Yes. So far, ODP has been vigorously taken up by vendors who supply much more functionality in their hardware than a plain NIC can provide. One of those vendors package this capability as a NIC + ODP library. The ODP project also supports its own ODP-DPDK implementation to help migrations from the lower level DPDK API to the ODPs abstraction. But traditional NICs are supported odp-linux has PKTIO support for Netmap and DPDK. Does ODP support polling mode? ODP does not dictate a model, although the majority of current contributors see greater value in an event-driven model which which it is felt will scale better than a polling mode driver. Does ODP add a lot of overhead vs. the native SDK? No, ODP is just an API designed by the contributors. The implementation is developed by the hardware vendor to be optimal for their platform. Even running OVS on odp-dpdk vs dpdk shows at worst case 1.7% overhead in basic tests. What is the difference between ODP and DPDK? ODP is an API, DPDK is a specific implementation of an API. Does ODP force the use of specific structures? ODP uses abstractions for the structures that are defined by the implementing vendor so that they map closely to the hardware and are very efficient. The application may then access this data though inline functions so that platform specific data is never exposed, for example odp_packet_len() is used to determine a packet length. Does ODP have legacy application support? ODP can be used to implement hardware acceleration for interfaces for sockets, or polling mode drivers. Does ODP provide everything needed for an application? No. ODP is defining the lowest level abstractions for hardware acceleration and it is expected that layers of software using these primitives will be able to add deeper application support. In addition ODP does not try to add Operating System abstractions. Where are ODP Data-plane Applications? They are traditionally the software in routers, switches, gateways, set top boxes, Evolved Node B, etc. Increasingly they are data-center applications that can make use of the acceleration features available in servers, such as Open vSwitch, TRex, NGiNX. How do I compile ODP with modified CFLAGS such as optimization flags zero (0)? Basically you need to pass -O0 to gcc, You can bake this into the generated makefile with the ./configure step, that is probably your simplest step. Also see the gcc manual and possibly ask on stackoverflow for more details on using gnu tools. This is a known issue in many cases, it is related to the use of some tricks to get strong typing out of C99 source code. If anyone knows how to inform valgrind that this is in fact correctly initialized it would be most welcome? Check the DEPENDENCIES file. Most likely with any CU macro error you are not using the correct version of cunit. How do we measure ODP implementation code coverage? OpenDataPlane testing information from GCOV (using LCOV extension). Includes performance results from gcov using code test suites. How do I send a patch to ODP? Read the odp/CONTRIBUTING file as a starting point, and then google for the many write ups about contributing to the linux kernel, ODP attempts to follow that kernel style as closely as reasonable. To check your patches will not be immediately rejected see the FAQ “How do I check my local patches are ready to be submitted”. How do I check my local patches are ready to be submitted? ODP uses Travis CI and you can run the CI loop in your forked copy of ODP repository using these instructions. How do I check my local commits build across ODP platforms? ODP’s Travis CI loop cross compiles the code on multiple platforms (arm64, powerpc, i386, x86_64). A checkpatch warning unlike a checkpatch error may be accepted if it can be shown that overall the code would be better by ignoring it. A common case is the line length warning in conjunction with printing debug output and a reviewer will ask why the patch was sent containing warnings. To possibly save a round of questions, write a note in the pull request comment section explaining why you think the explanation should be ignored. How do I build a standalone app against ODP? 3.) Now just use -I and LDPATH to point to them as normal from a make file. See http://www.gnu.org/software/make/manual/make.html or Google gnu makefiles. By going through the code I noticed that there are a *lot* of functions for atomics that do almost the same thing but not exactly? The differences are quite important here. The public odp/atomic.h uses a relaxed memory model so only suitable for things like statistics and shared sequence numbers etc. The internal atomics support supports a memory ordering parameter which make these functions usable for designing lock-less multithreaded data structures (and the implementation of the locks themselves). As it is not supposed that the user will design their own lock-less data structures, this API is internal to linux-generic (and thus may not exist on all platforms).